There were so many groups coming thick and fast that some aspects have fallen out of my head already… So this won’t be a very intelligent discussion, but I’ll try and cover what I can remember coherently! I’ve stuck a few of my more interesting photos here… Didn’t get too many that were decent one way or the other (and most of them are from Monday, so scroll down…), but the rest I’ll put up on flickr at some point. This is also quite a long post, so I’ll reserve the right to continually fiddle, and reorganise things at a later date. A slightly varied first day, kicked-off by the outstanding trio of Eddie Prévost (percussion), Joe Williamson (double bass) and Alan Wilkinson (saxes). Only Wilkinson had I seen before; he usually plays pretty intense and free, but this trio was actually pretty jazzy. I think the main jazz pulse came from Prévost, whose drums were pretty swinging, in the more conventional sense. Joe Williamson played some nice jazz-like lines, while Wilkinson sort of sprawled around fierily, on top… Didn’t plump for their trio CD, but got a Wilkinson/Prévost duo recording, although I haven’t listened to it yet (getting access to the large Psi/Emanem/Matchless/etc record stall at the back of the room was a worthwhile aspect of the festival itself!). PS. The next Bohman Brothers Present is next Thursday (against normal practise, which would have made it a week next Wednesday), supposedly featuring Ingrid Laubrock playing the music of Steve Lacy?!? I remember reading a review of this in The Wire, or something, ages ago, but was never able to actually track it down… But last week I found it on eMusic, and I just can’t stop listening to it. 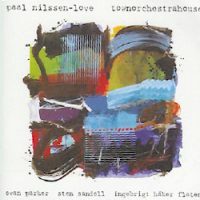 Paal Nilssen-Love (d), Sten Sandell (p), Ingebrigt Håker Flaten (b), and Evan Parker (ts/ss), recorded live at the 2002 Kongsberg Jazz festival. And it’s a proper twin-set-and-encore live recording, so it’s a good almost-as-if-you-are-there-but-obviously-not thing. The tracks are Town (first set), Orchestra (second set) and House (encore). (Is Townorchestrahouse a literal Norwegian–English translation?) Parker plays tenor on Town, and the whole group is really full-on. It’s noticeable (tho, I don’t mean, too noticeable) how close they seem to be following each other, trying to play to each other’s styles; sort of like the Norwegians trying to work out how to play Evan Parker; Evan Parker working out how to play Norwegian. The second set, Orchestra, sees Parker come back on soprano for the most part, and there’s a definite change in the group dynamics; a bit looser in the sense that, on Town, they’re trying to play as a unit, whereas on Orchestra they’re playing as four individual members of one group… Parker’s soprano just sounds so excellent! The highpoint is his own solo, about two thirds of the way through, where the rest of the band just peel away and drop out; the only sound left is the sax, the audible dynamics of the club itself, passing traffic outside… and it’s beautiful. In retrospect it’s like the whole piece is a build up to this peak, the frantic rhythms and build of Parker’s solo-playing reflected in the movement of the preceding twenty minutes of group improvisation (there’s a more eloquent description of this at One Final Note). Paal Nilssen-Love plays great throughout, but then I think he always does; I like his style, it’s almost as if he’s soloing behind everything. Sten Sandell plays some great scattering melodies, everywhere. Ingebrigt Håker Flaten I’ve heard on other stuff (like, with Atomic and The Scorch Trio) but I’ve never really *heard* him; other reviews seemed to imply that he’s not at his best on this disc, but I’m loving his great deep guttural sounds; it seems such a peculiarly deep bass sound. He plays out the first set solo, and it sounds pretty special. Looking around, it turns out that it’s quite easy to get hold of this disc after-all, and I definitely recommend it (although it’s been out a few years already so I’m probably the last man alive to hear it). Get it from Clean Feed records direct, or try eMusic.